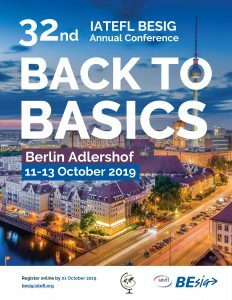 We are very excited to announce that the 32nd IATEFL BESIG Annual Conference will take place at Wista conventions Adlershof, Berlin, Germany from 9.00am on Friday, 11 October to 2.00pm Sunday, 13 October 2019. Last year in Iasi, we explored the frontiers of business English, with over 80 talks and workshops on coaching, technology, management, soft skills, intercultural communication and innovative teaching methods. This year we’re going back to basics and investigate which tried and tested methods have stood the test of time and which innovative practices have become fundamental concepts in business English in recent years. The conference will also include a GISIG strand on tackling global challenges such as sustainability, climate change and inclusion in the business English classroom. Our venue is Wista conventions in Berlin Adlershof. With seven elegant and fully-equipped conference rooms, a state-of-the-art plenary room and a generous exhibition area, Wista conventions can welcome maximum 450 participants. It only takes half an hour by S-Bahn to get from Alexanderplatz in central Berlin to Adlershof. The main road here is Rudower Chaussee, and the tram running along it connects the university campus, the Technology Park and even a new residential area, further linking the areas to either side of the railway. There are over 20 eateries and restaurants in the area, as well as 3 hotels. Registration is limited to only 450 delegates and we expect to sell out early this year for our long awaited return to Berlin. Registration and our Call for Proposals open 16 April 2019 and the Call closes on Friday, 31 May 2019. More information about accommodation and transportation will follow soon. IATEFL BESIG’s annual conference is one of the largest annual gatherings of the international business English teaching community in the world, with unrivaled opportunities to network and connect with key players. If you are interested in sponsorship or advertising opportunities, please contact our Administration and Sponsorship Coordinator at maria.szugfil@besig.org.